If I live to be 101 years old, I would be perfectly happy if I could only eat meals from the wealth of terrific recipes in the August 2009 issue. While I don't completely agree (throw in the September issue and you've got a deal), I did find the August issue to be particularly rife with appealing recipes. I have already made a few dishes (the Tomato and Corn Pie was especially good), but it is only a dent in my list of bookmarked recipes. The recipe for these zucchini and pepper enchiladas was part of that August issue, and it is a very good, though slightly flawed recipe. I immediately wanted to make these because they looked so bright and fresh, and they were not drowning in cheese or completely enrobed in a sauce. I would be lying if I said I did not love those cheese-covered enchiladas, but I imagined that this recipe would be a nice, light take on the original. Maybe I was being willfully blind when I scanned this recipe and jotted down a shopping list, because I somehow managed to miss the CUP of oil called for in this recipe. Half of it went into a pepita salsa, but the other half cup was used to pan-fry the enchiladas. So while they certainly could be worse, nutrition-wise, these enchiladas were not exactly the light dish that I had been imagining. Because of the pan-frying these enchiladas were a bit heavy. 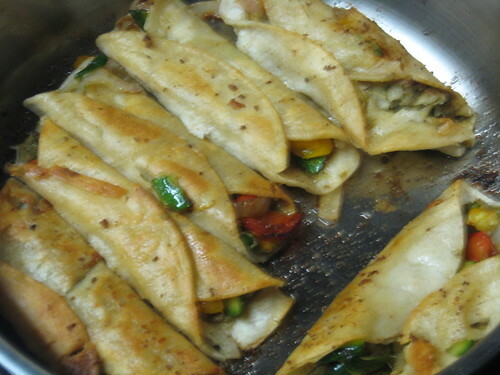 The problem was that the grilled vegetables inside the rolled tortillas absorbed too much of the oil. Next time I make these I will try using less oil, or I might forgo the frying altogether and just bake them, perhaps after giving them a brush of olive oil. Hmmm, maybe I would even give them the same treatment as the vegetables and grill the assembled enchiladas. But, yes, there definitely will be a next time because this recipe has a lot of potential. 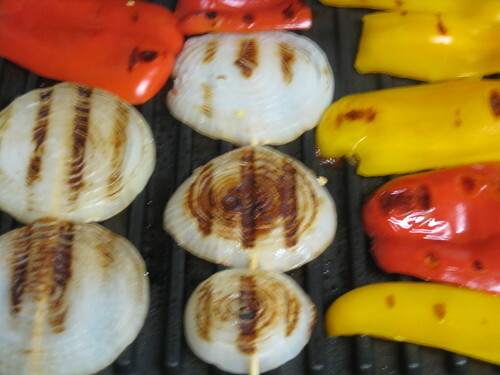 I loved the grilled vegetables, which were nicely caramelized and sweet. Both of the salsas were very good (though I have some minor criticisms, which I will get to a second) and combined nicely with the crisped enchiladas, and a bit of salty cheese and the crunch of toasted pepitas were the perfect finishing touches. Now, about those salsas; the fresh tomato salsa was good, but it was very basic and you could swap it out with your favorite pico de gallo or salsa fresca. In the future I would add some chopped cilantro (I can never get enough cilantro; I love it so much I want to marry it.) and more serrano chile, as we are a spice-loving household. The pepita salsa is where the recipe goes a bit awry. First of all, it made a huge amount. In the future I would probably halve or two-thirds it. Also, the recipe calls for the pepitas to be cooked in oil over medium high heat with two minced garlic cloves for 4 to 5 minutes, and my garlic started to burn well before my pepitas had begun to pop. Next time I will add the minced garlic in at the end. I will also most likely add more chile to this, as well as more cilantro when I blend it (see above). As I am writing this up I am getting more and more excited about taking this recipe and giving it a bit of an overhaul; turning it into the "herbaceous and fresh" enchilada that the recipe promised. In light of Gourmet's recently announced closure I am tempted to glorify their recipes, but that would be unfair to the magazine and to you, my readers (perhaps I am flattering myself with the plural). Gourmet's recipes may not always be perfect, but they are a constant inspiration to me. Preheat a gas grill for direct-heat cooking over medium heat. * Preheat oven to 350 degrees. Secure each onion round with a wooden pick for grilling (this is not necessary if you a using a tabletop grill, but I did it anyway). Oil grill rack then grill vegetables, covered, turning occasionally until tender (6 to 8 minutes for bell peppers and zucchini; 10 to 12 minutes for onion), transferring to a bowl. Wrap tortillas in stacks of 6 in foil and heat in oven, about 15 minutes. Meanwhile, make pepita salsa. Cook chile, garlic, cumin, and pumpkin seeds in oil in a 10" heavy skillet over medium-high heat, stirring, until seeds pop, 4 to 5 minutes. ** Transfer 3 Tbsp seeds with slotted spoon to a bowl and reserve. 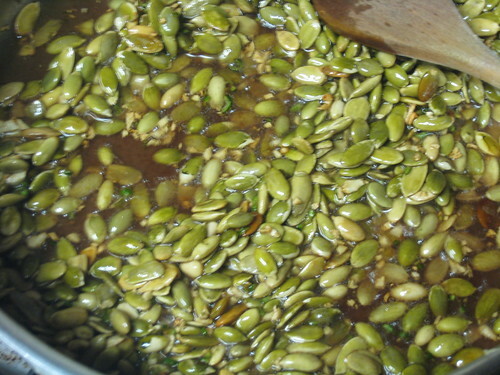 Puree remaining seeds and oil with cilantro, water, and 1/2 tsp salt in a blender until smooth. Make tomato salsa: Stir together tomatoes, onion, chile, lime juice and 1/4 tsp salt. 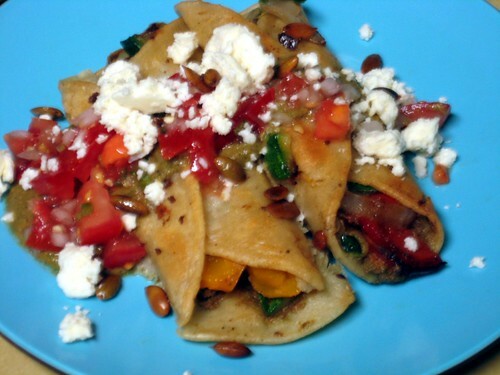 Assemble and fry enchiladas: Cut vegetables into strips. 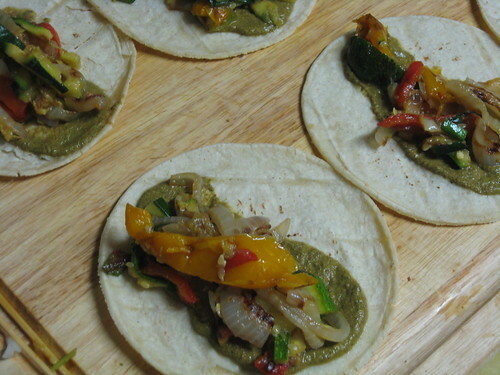 Spread 2 tsp pumpkin-seed salsa on each warm tortilla and top with some of the grilled vegetables, then roll up. Heat 1/2 cup oil in a 12" heavy skillet over medium-high heat until it shimmers. Fry enchiladas, seam side down first, in 2 batches, turning once, until lightly browned and heated through, about 2 minutes per batch. Transfer enchiladas to plates, then drizzle with remaining pumpkin-seed salsa and sprinkle with reserved seeds and cheese. Serve with tomato salsa. *You can also grill the vegetables in an oiled grill pan or in a tabletop grill, as I did. **Because of the problems I had with burned garlic, I would recommend adding the minced cloves after about 3 minutes of cooking.